So so so it’s Friday! And after my boring (but hopefully helpful) post on Wednesday, I want to talk about some decor things again. First of all my daughter painted me a piece of artwork (which my Instagram followers saw already) and I ADORE IT. She is so proud that I hung it up in the living room…so we are all happy…yay! Well almost. She was a little upset that I hung it the wrong way, according to her it goes sideways. Might have to fix that yet but then it doesn’t fit on the wall that I hung it anymore. She told me that she picked all the colors that I love. Even gold! She paints all the time and I adore them all but this one is just speaking to me in every way. She even added a little heart on the left and that’s how you can tell it’s hanging the wrong way she said. Duh, what was I thinking? Just had to take a photo of this because I love it! I also tried out my parents old rug in our kitchen. Or I could call it my childhood rug because it was in my room as a teenager and before that it was somewhere in my parents living room. I have showed it twice now on Instagram but thought I’d share it here as well. And YES I adore it and I also know it’s completely different then what I have otherwise. 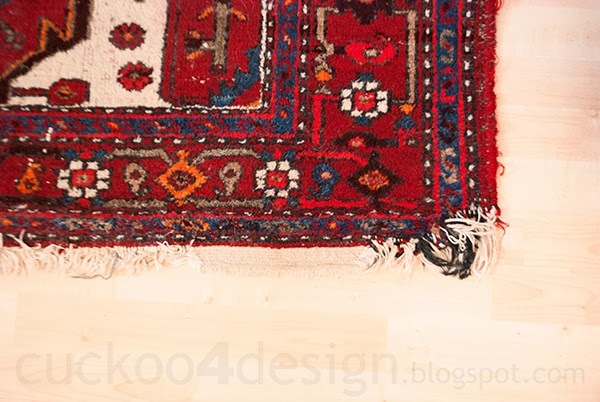 This would cause a chain reaction in having to change more stuff up in order to keep the rug. It is really worn and old. I don’t know who owned it before my family but it is antique. My parents vacuum cleaner and our childhood dogs did a number on it. See the corners? After having it in our kitchen for only a day I have to say that my cats think it’s a scratching post. They are all over it. I hate that. The outdoor Ballard Design rug we had there before is so durable and I might have to change it back because I don’t want them to ruin this sentimental piece of my past. I really want to find a spot for it in my house though. Sigh! So let me think about this one a little more. I sure like it with the plate wall! But I’m not declawing my cats! Have an awesome warm weekend my friends. And get the paint brushes out so your kids can paint you something for your home! I love your daughter’s painting! We have framed kid art all over our house. My favorites are two pieces that their school sold at an “Art Gallery” event one year. One is a watercolor self-portrait and the other is a pen drawing of a grasshopper. I am always impressed at what my kids learn and produce in art class every year. Great old rug, too! 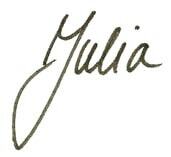 Julia! I love that you framed it and hung it in the living room! Love the colors she used and so often you see abstract art and love it for the colors but it’s so much more special when your kids create it!! I love the rug so if you decide not to use it in there you need to find a space for it!! that rug is amazing!!!! you know i love it! and i love lily’s artwork!!! i bet she is so proud! 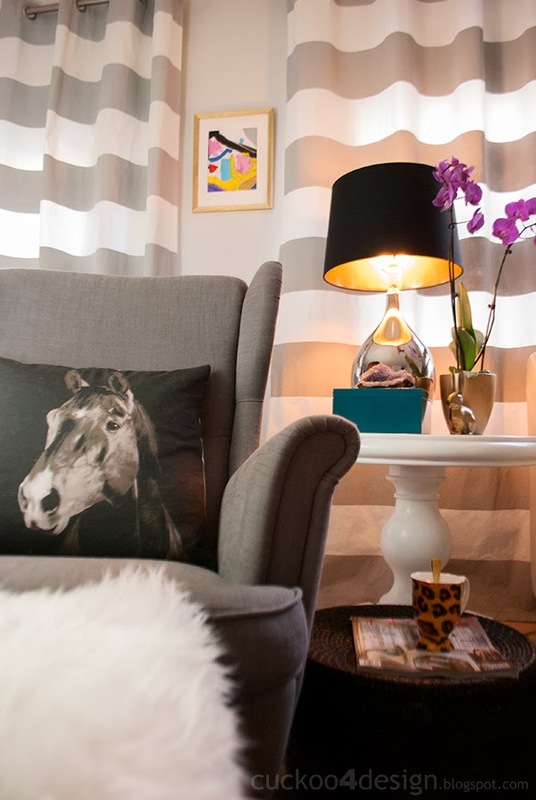 Love that your showing/displaying her art in a way that fits your style. Greyson drew me a piece for Christmas and I framed it, but I just can’t put my finger on where to put it. Hate when that happens! That rug is gorgeous! Your daughter’s art piece is amazing! Love the fact it’s hanging the “wrong” way! Maybe you could convince her that it makes it more “unique” that way???? Doubt that! I have a similar problem with a very valuable rug on my Grandmother’s. It’s raveling like yours and using it is only makes it worse. I have no idea what to do with it. I try it in different locations, and end up rolling it back up and putting it away. I love framing my kids’ art! It makes them feel good, and also, they make some great abstract pieces! Who needs to pay hundreds for that? I have especially framed my faves in my office which also houses their art area. I’m an artist, so I know how important it is to give them confidence in their creations at a young age. I also want to instill the love for art in them. Love your sweet new abstract!! 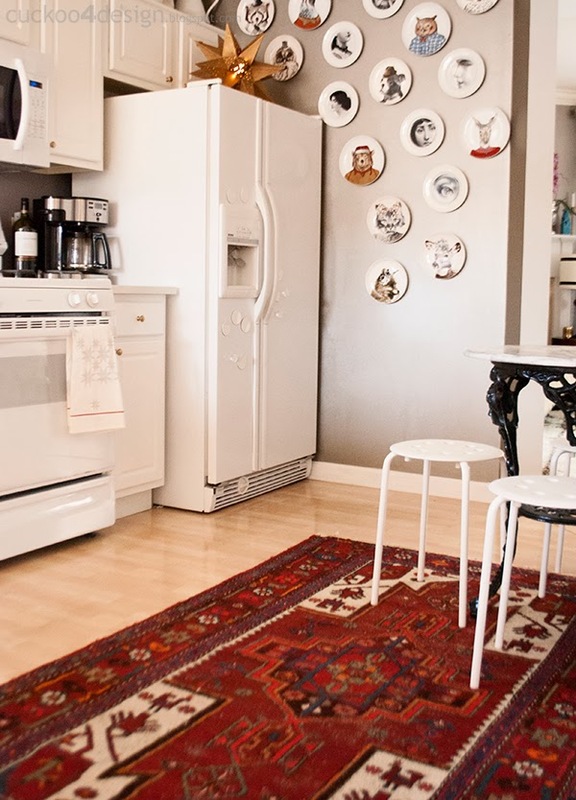 And that rug is gorgeous in your kitchen, you definitely need to find a place for it!! Happy weekend friend! It’s as if you commissioned that piece for your space! She did a great job, and it’s beautiful framed and hung in that spot! aw–all your favorite colors–so sweet–love it! And I’m definitely in love with that rug. cats…sigh. Love her artwork! She’s going to be pretty talented. I can tell already. Tell her abstract painting have no direction because everyone gets something different from them. You got that it should be hung that way. Think that will appease her? Love that rug. Gorgeous! If you feel like you really can’t work it into the house, feel free to send it my way! Also those stools!! Where did you pick those guys up? 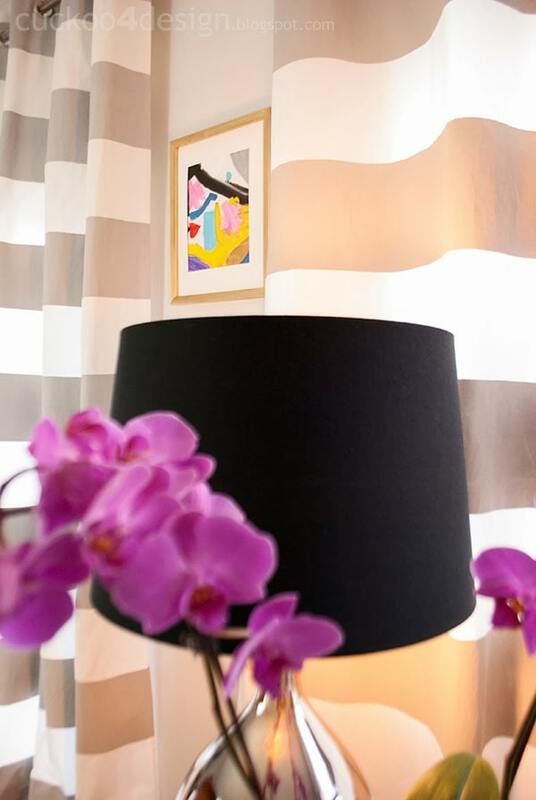 I love incorporating children’s art into decor. And your rug is fab! 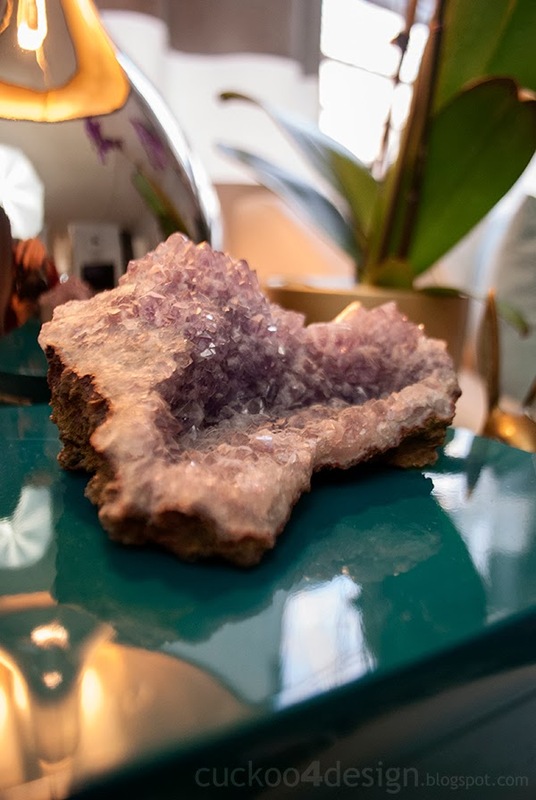 Surely you can find a spot for it somewhere in your home? What about hanging it up (in the basement, perhaps?) to get it out of the way of the kitty paws? I love that you hung her artwork! I have a painting my oldest did a couple of years ago in art class that is framed and on our living room shelves. Love special things like that. Your childhood rug is awesome, but I understand the cat part. I have a similar one in my kitchen and Figaro is great with it but he ruined the sisal rug we previously had. Have a great weekend! You already know how much I adore kids artwork on display. Your daughters is just gorgeous. And I freakin LOVE that rug in your kitchen. I think it looks perfect in there just as it is. I love your daughter’s art!! Looks like a Kandinsky print I would buy for my own wall. 🙂 And that is the thing about cats–they think everything is either a bed or a scratching post. So annoying! But we love them anyway. I heard you can put a scratching post near something they are scratching and everytime they go for the carpet you literally lift them and place their paws on the post instead. A positive redirection. I love that rug though and hope you can find a place for it! Your daughter is quite the little artist, I love how she used all your favorite colors! What a sweetheart – I love L’s painting for you! 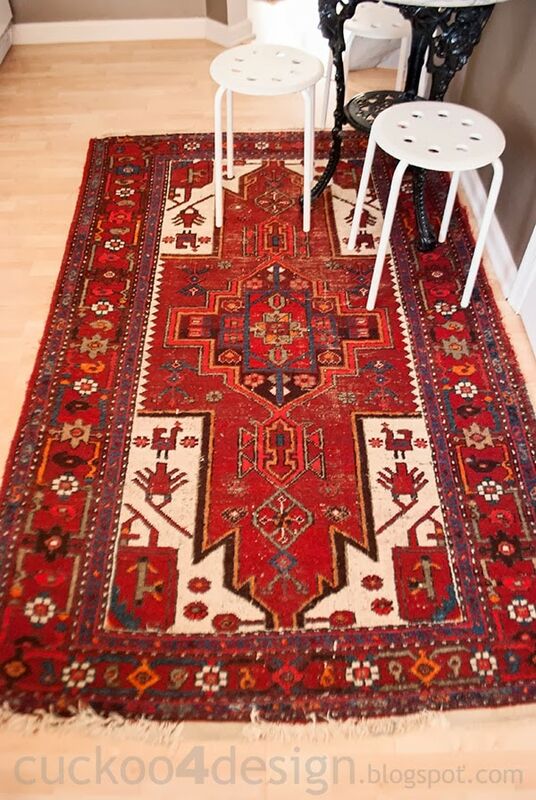 Beautiful rug too, I hope you can find a place for it!! I fell in love with that painting when you first posted it and I love that you put it into your living room for all to see! Perhaps it’s time to put some of her work on your etsy shop! (: I hope your outdoor kitty is going good, I’ve been thinking about that sweetie! I love it! What a great piece of artwork. (And the rug is spectular, even in it’s current condition!) My favorite thing on my gallery wall is a neon done by my daughter when she was in preschool. She was three! See it here (It’s the one in the middle): Love your blog! 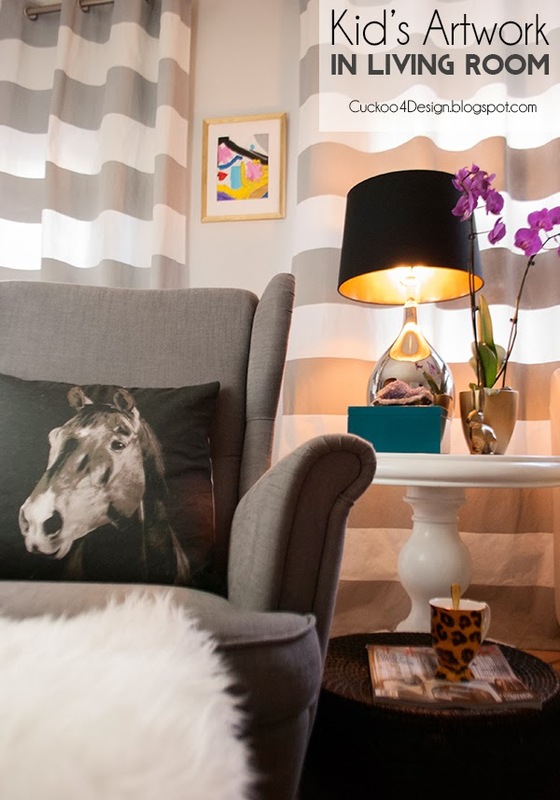 That little piece of art looks so cute in your living room! 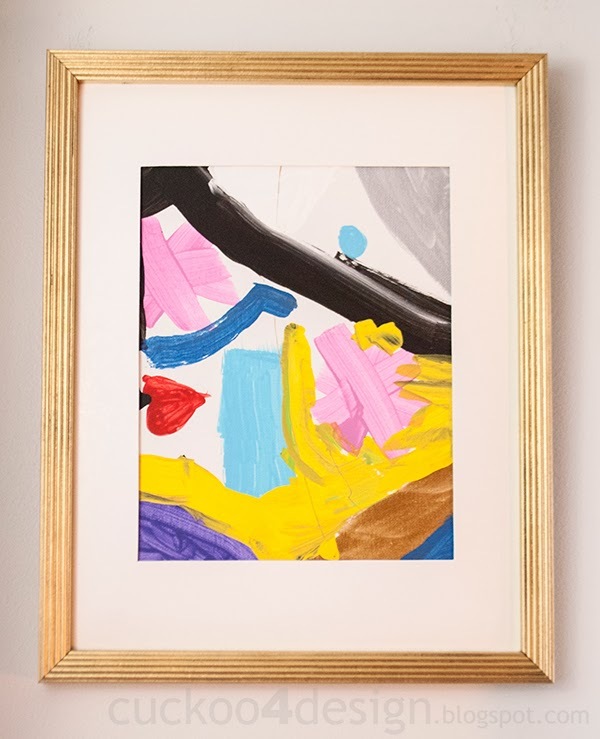 Somehow I missed this post over the weekend… Your daughter’s artwork is gorgeous! I love it! I could never just sit down and create something like that. I think it’s so sweet that you framed it! I love this artwork so much – it’s perfect for your space and looks like something you’d pay big bucks for. She has a gift.